Apple MacBook Pro set for Haswell's all-day battery life boost this October? 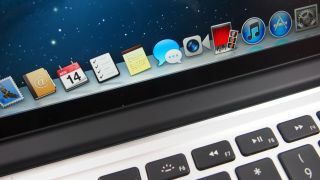 2013 MacBook Pro refresh on the way? The expected Haswell refresh of Apple's MacBook Pro notebook range will happen in October this year, according to our old friends Mr & Mrs Supply Chain Source. The China Times reported on Friday that Apple is gearing up for a launch before the Christmas season, with the paper's insiders claiming there'll be no price bump as a result of the inclusion of Intel's new chips. Apple has already fitted its MacBook Air devices with the new generation i5 and i7 core processors and the results have been widely lauded. Thanks to much-improved power efficiency, Haswell chips have granted laptops and notebooks that elusive Holy Grail of near all-day battery life, with double the life-span of the previous generation models. Earlier this week Apple promised 'exciting products' would be coming "this fall," with new iPhone and iPad models expected by the end of the year, along with the arrival of iOS 7 and Mac OS X 10.9 Mavericks? With the MacBook Pro refresh also on the horizon, what else could Apple have in store? Could it surprise us with the earlier-than-expected iWatch launch? Or perhaps some major developments with Apple TV? Here's everything you need to know about Intel's Haswell chips. Aren't we nice?